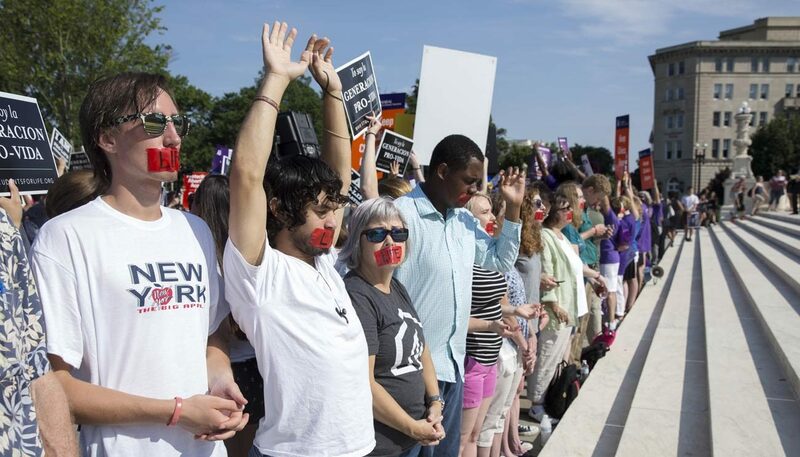 WASHINGTON (CNS) — The day after the U.S. Supreme Court issued a major abortion ruling striking down regulations on Texas abortion clinics and doctors, it rejected an appeal to reinstate laws in Mississippi and Wisconsin that would place similar requirements on abortion doctors. It also denied an appeal of a Washington state rule requiring pharmacists to dispense Plan B or other emergency contraceptives despite their religious objections to doing so. The court June 28 refused to hear appeals from Mississippi and Wisconsin challenging lower-court rulings blocking their laws similar to the one in Texas that require abortion doctors in the two states to have admitting privileges at nearby hospitals. Federal appeals courts in Chicago and New Orleans had previously ruled against the states. Wisconsin Attorney General Brad Schimel said in a statement that the court’s decision was “not surprising” after its rule on the Texas law. He had filed a friend-of-the-court brief in the Texas case. Mississippi Gov. Phil Bryant said he was disappointed by the court’s Texas ruling and Lt. Gov. Tate Reeves said the ruling endangers women’s lives. According to The Associated Press, if Mississippi’s law had been enacted it would have likely led to the closure of the state’s only abortion clinic. “If this is a sign of how religious liberty claims will be treated in the years ahead, those who value religious freedom have cause for great concern,” he added. A trial judge ruled twice for the pharmacists in the long-running lawsuit Stormans Inc. v. Wiesman, but was overturned by the U.S. Court of Appeals for the 9th Circuit. Even before the Supreme Court issued a decision on whether it would take the case, the pharmacists’ case already had gathered 14 friend of the court briefs from supportive groups, groups supportive of the including the U.S. Conference of Catholic Bishops. The case was filed with the court by the legal group Alliance Defending Freedom. She added that the state of Washington allows pharmacists to refer customers to other pharmacists for just about any reason — except reasons of conscience — and the other 49 states allow conscience-based referrals, which are fully supported by the American Pharmacists Association and dozens more pharmacy associations. “We are disappointed that the high court didn’t take this case and uphold the (federal district) trial court’s finding,” she added. In court papers, Washington state officials argued that while individual pharmacists can refuse to fill an order, an entire place of business cannot refuse to fill a legal prescription. It also said the pharmacy’s main objection of dispensing emergency contraceptive is not as strong because the product is now available over the counter. The pharmacists, Margo Thelen and Rhonda Mesler, and the Stormans family, who operate the family-owned pharmacy Ralph’s Thriftway, in Olympia, Washington, have been fighting the issue in court since 2007. That year a federal district court rule din favor of the Stormans, but that decision was overturned by the 9th Circuit.